Poison Ivy Spray (or Poison Oak Spray as well) is an Anti-Itch Spray formulated with jewelweed and essential Oils. Both essential oils and jewelweed are know to help relief itch and swelling caused by poison ivy and poison oak. Oops you ended up in poison ivy (or oak, sumac, etc) and you thought you scrubbed it all off. But now you have a rash. Not only a rash but it itches like crazy. Shake this bottle well and spray on the affected areas. It will help sooth the itch and dry out the rash. Continue to use until all of the rash has gone through it’s process of popping and drying out. 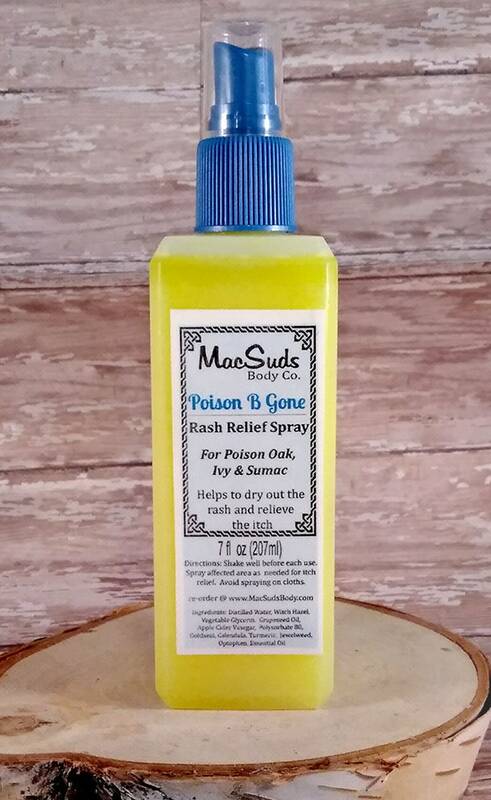 This Poison Ivy Spray (or Poison Oak Spray) is excellent for skin healing and itch relief of poison ivy, oak and sumac. Reduces pain and swelling of bee and wasp stings. Relieves the itch from mosquito bites. My main idea when I formulated this was for poison ivy, oak and sumac. But I have been told my many customers that it works on all types of bites, stings and rashes. Excellent for all skin types and anyone with dry itchy sensitive skin. This is an absolute must have for everyone’s first aid kit!! The perfect gift for campers. Can be applied directly to face and neck area using a cotton ball. Ingredients: distilled water, witch hazel, polysorbate 20, liquid glycerin, grapeseed oil (infused with jewelweed, lavender, calendula, goldenseal, turmeric), aloe vera, tea tree & lavender essential oil. Wish I could smell more than just witch hazel. I could not smell any essential oils.Results were ok didn’t really help with poison ivy or mosquito bites. TO MY KNOWLEDGE MY FRIEND LOVES THIS ANTI-ITCH SPRAY AND IT HAS BEEN ABLE TO HELP HER WITH THE ITCHING SHE HAS BEEN EXPERIENCING DUE TO THE BLACK MOLD SHE HAS BEEN LIVING WITH IN HER HOUSE. FORTUNATELY SHE WILL BE LEAVING THAT HOUSE ON TUESDAY AND I AM DELIRIOUS WITH JOY!!!!!!!!!!!!!!!!!!!!!!! THANKING YOU FOR YOUR HELP!!!!!!!!!!!!!!!!!!!!!!!!! !111 MANY BLESSINGS AND MUCH LOVE!!!!!!!!!!!!!!!!!!!!!!!!!!!!! NAMASTE!!!!!!!!!!!!!!!!!!!!!!! ************JUST WANTED TO LET YOU KNOW, SHE HAS SINCE MOVED OUT OF THAT HOUSE INTO ANOTHER, SAFER HOUSE IN A TOTALLY DIFFERENT STATE; BUT I WANT TO THANKE YOU FOR TAKING A PERSONAL INTEREST IN HELPING US...........HELPING HER!!!!!!!!!!!!!! YOU HAVE BEEN VERY KIND AND THOUGHTFUL. IT HAS BEEN MOST APPRECIATED. GOD BLESS YOU ALWAYS. The spray really works to stop the itch. I love that it's easy to apply and smells good. Thank you for super fast shipping . You're A # 1 !